Shop the top quality products of Coles Catalogue specials in this weekend. Don't miss out any deal from the coolest catalogue of the weekly essentials. You can find a great range of products like fresh food, meat, recipes, top deals and the best meat products. Coles Catalogue Specials Jul 25 are consisting of the very high quality material for every aisle. Don't miss out the great deals by Coles Catalogue in this week. 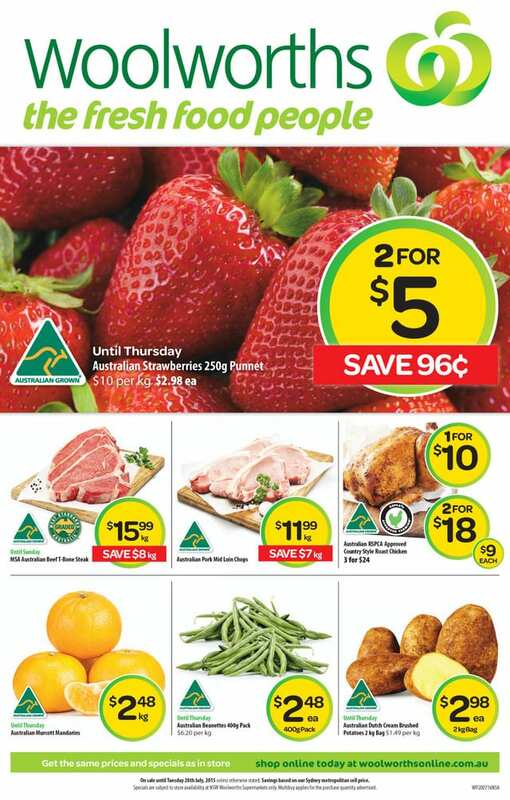 Ultimate deals of the fresh products for each week are available in Coles, Woolworths Catalogue. Also see everyday prices of the Coles Catalogue. Weekly reviews, news from all brands are available to read on the main page. These are not the whole range of this week. Check out Woolworths Catalogue to get one of the cooles deals. Win 1 of 10 ultimate sports holidays, red spot specials half price products of snacks, beverage and fresh grocery products, household items and more are featured on latest Woolworths Catalogues. Woolworths Weekend deals are generally fresh food, meat and fruits. In this week and last week we saw the essentials for better prices. All the food products are approved by the authorities of Australia. You can already read the titles of the products with this statement. View the full range of Woolworths Catalogue to get more savings and higher quality products each week. Also check out main page categories for the Coles, IGA, ALDI and other Woolworths Catalogues. See the latest Target toy sale featuring the top brands of the toys of the whole world. We can browse a new ALDI Catalogue Special Buys product range which is full of products on sale. The special buys are home products, decoration items for garden, bedding products, power tools, hardware by Workzone and ALDI grocery products. As many times it did ALDI offers a good quality of kitchen products for better meals, food and cleaning in your kitchen. Mortar, pestle, chopper, chopping boards, bowls and similar products are featured on this section of the latest ALDI Catalogue. Asian decoration item carrying a theme of the spiritual world of the middle and south asia are available on pg 6&7. Check out these products if you are interested in decorating your garden with statues, and placing some of comfortable patio furniture there. View pg 8&9 for the details about the products of bedding. Sleep deeply with soft touch of high quality bedding products by ALDI Catalogue. Don't miss out this classic range of bedroom products by the retailer. Moreover: SAT will be the day of sale of special products like school supplies. Books, notebooks, world globe, pencil, telescope, modifying glass, some games, combustion engine and similar sort of educational products are featured on the latest ALDI Catalogue. Visit pg 12&13 for professional work tools by Workzone. On SAT 01 AUG you can shop grinders, sanders, and accessories, hacksaw, bracket sets, drill press, step light, angle level and similar sort of products are on sale. Rest of the catalogue of this week is about the ALDI grocery, meat, packaged food products etc. See more catalogues like Target Toy Sale, Kmart and Woolworths and Coles Catalogues that are weekly good food products.